Are there any maps online that depict what is private property and what is crown land etc? I have State Forests and National Parks etc worked out. So I know where I can an can't go in those regards, just unsure of private property. What state are you after information on Jazz ? You can also search the forum for information. 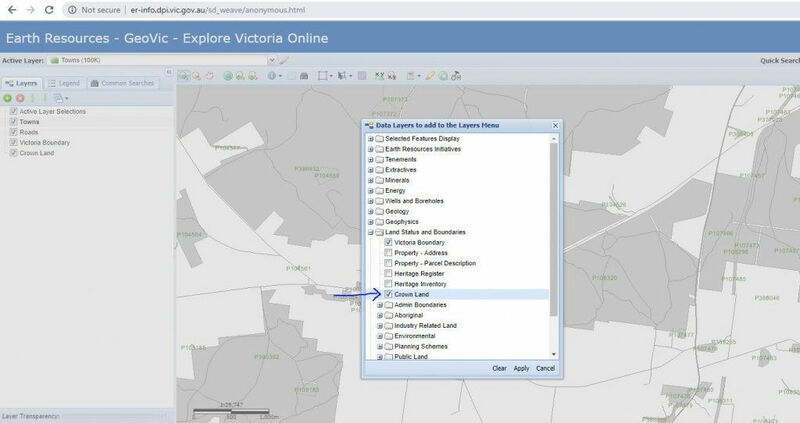 In Victoria, you can find it in GeoVic. There's a good tutorial on YouTube on how to use GeoVic. The Australian bush - love it - take care of it. Don't forget, not all crown land is accessible. A lot of crown land is leased out to people for up to 99 years. And then becomes treated as private land. Commons are usually a good search. Thanks for the info, guys! I should have mentioned NSW. SixMaps looks like a very solid start. What are the rules for large rivers that have private land (different owners) on each side? Are you allowed in that river? if it was on your property what would you say ? It's not, as given in my example. I wasn't talking about a river that is running through someones land. Heaps of variables in NSW, on rivers, boundries, etc. And can change within a km. Im sure most rivers in nsw can be traveled via a boat etc. So long as you access the river via public land or with permission on private property. This law was updated some time ago for fishing purposes. Some property owhers can own both sides of the river, yet not the river boundry. If you find an interesting part of the river you want to explore for a pan, best to just put the effort into asking the owner of the area to ghe river in some circumstances. Perfectly fine question Jazz and MH’s links will serve you well. Planning on heading out tomorrow to have a geezer in a spot I found during the week, in state forest. Looking forward to a big day out. I never enter a river through a fence. I had trouble with a bloke at Nundle NSW some time ago that took exception to all fossickers. He complained, a local ranger turned up. He pointed out that there were private property fences on one side of the river, but I explained that, I hadn't entered the river through any fences and that the farmer cannot own the river and in fact the fences some distance from the river. He then went on the mention turbidity, but after I said that he might like to take that up with the guy who complained, as his cattle which he was moving along the river might be causing a fair bit let alone urine and faeces being dumped in Tamworth's drinking water, he checked my pensioner card and left.